Mish's Global Economic Trend Analysis: What's "Really" Behind Gross Inequalities In Income Distribution? What's "Really" Behind Gross Inequalities In Income Distribution? Here is the question of the day: What's Behind Gross Inequalities In Income Distribution? I ask the question after reading three incorrect answers in the article Inequality and the Second Gilded Age on the Real-World Economics Review Blog. Writer David Ruccio kicks things off by stating "The only way you can answer that question is based on a theory of value — a theory of how commodity values are determined and how the resulting flows of value are distributed to different participants in the economy." Ruccio gets off on the wrong foot because there is no such a thing as "commodity value" that can be measured. Here are a few snips straight from chapter 2 "On the Measurement of Value" from The Theory of Money and Credit by Ludwig von Mises. Although it is usual to speak of money as a measure of value and prices, the notion is entirely fallacious. ... Acts of valuation are not susceptible of any kind of measurement. ... But subjective valuation, which is the pivot of all economic activity, only arranges commodities in order of their significance; it does not measure this significance. Ruccio goes on to state "Brad DeLong, who admits that he was wrong to presume that the late-20th century America would be 'a much more equal place than early 20th century America,' focuses on exogenous factors such as winner-take-all markets in an increasingly globalized world and skill-based technical change to explain growing inequalities in the Second Gilded Age." Clearly there is a "winner-take-all" concept in the markets, but it should be equally clear that winner-take-all is not primarily based on technical skills. Did Mitt Romney really have any "technical skills" or did he learn how to use leverage to his advantage? Most top executives of financial companies have no "technical skills" to speak of although many do have "analytical skills". Many one-percenters were nothing more than huge gamblers. Get enough people gambling, and the law of averages says some will strike it big. Some were just plain lucky. The worst explanation comes from Mark Thoma who emphasizes "the changing political tide over the last few decades, and how that has altered public policy towards institutions such as unions that were able to help workers get a fair share of the output they produce." Good grief. If you are looking for someone who is 180 degrees wrong and is not even in the correct ballpark, then look no further than Thoma. The fact of the matter is unions, especially public unions have bankrupted cities states and municipalities by driving up costs far more than politicians were willing to hike taxes to pay for them. Many police and firefighters make more in retirement than they did working. Moreover, a majority of them get to retire at age 50 or so, provided they put in 20 years. Those benefits may not be in the top 1% but they are probably in the top 5%. Who has to pay for that? The bottom 95%, that's who. Let's step away from the misguided notion of "value" and reflect on the last two major boom-bust cycles. In 2000, there was an internet boom of epic proportion followed by an equally large bust. Who benefited from that? Clearly it was not the 99%. From 2002 through 2006 there was a housing boom, the biggest the world had ever seen. Who benefited from that? Clearly it was not the 99%. By the time those on the bottom end of the totem pole took part in the credit expansion boom, they were destroyed by it. Many one-percenters (with zero technical skills) amassed fortunes during the housing boom. Some lost it all back. Others (with zero technical skills) made fortunes betting against the bubble. Still others went broke betting against the boom too early. Some gamblers won and some lost. Technology had nothing to do with any of it. Take a look at Countrywide Financial CEO Angelo R. Mozilo. He cashed out $1 billion in stock options in a few short years during the housing boom. Yet the company itself became nearly worthless! If one really wants to understand "gross inequalities in income distribution" one needs to understand precisely how and why that happened. Here's a hint. Lack of unions had nothing to do with it. Fiat money does. So does fractional reserve lending. My good friend, Hugo Salinas Price touches upon the root cause of income distribution inequity in his latest article Reflections on the effects of War as compared to the effects of Fiat Money. I encourage you to read the entire article because he provides excellent historical perspective, but here is one critical snip. Fiat money is the child of the arrogance of human intellect, which has sought to invalidate the laws of human nature which have regarded the precious metals as money for thousands of years, and sought to substitute an intellectual construct for the real thing. Now we are going to pay for that arrogance. Fed Chairman Ben Bernanke would have you believe deflation is a bad thing. Common sense says otherwise. So clearly Bernanke is devoid of common sense. Ask anyone on the street if they want lower food prices, lower energy prices, lower rentals, lower health-care costs, or lower education costs. 100% of the 1% would want exactly that! 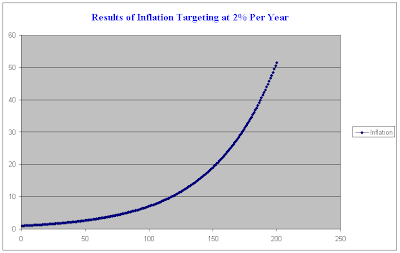 Many bad things can happen with Bernanke's 2% inflation target. Wages do not keep up. Take a good look at that first bullet point. Did wages rise to keep up with inflation? They did for a while. Then what? Then manufacturers decided to move jobs to China. Then we had boom bust cycles of immense proportion as Bernanke saved the banks and the bondholders (the wealthy) at the expense of the 99%. The 1% knew all along Bernanke would do that because Bernanke carried out the same fatally-flawed moral-hazard "too big to fail" policies as Greenspan. Bernanke also slashed rates to 0% and paid banks on "excess reserves". This is free money for the wealthy but yields 0% interest for those on fixed income. Now Bernanke is so trapped in his academic ivory tower that he cannot figure out that he personally is part of the problem. The American mathematician Andrew Bartlett claims that “The greatest shortcoming of the human race is our inability to understand the exponential function”, to which I’d add that that shortcoming almost defines neoclassical economics. 2 percent per annum doesn’t sound like a lot, but over 36 years that means the ratio doubles, over 72 it quadruples, over 144 it becomes 8 times what it was, and so on. Mish provides some nice graphs to illustrate this process. 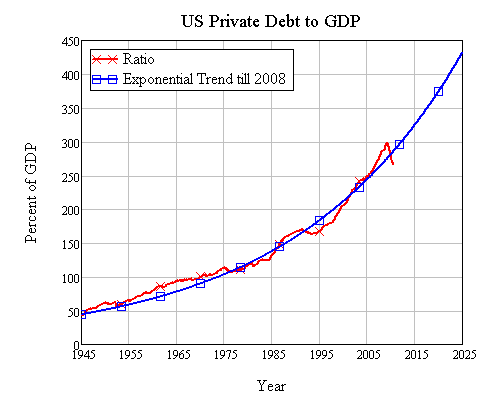 For the record, the actual rate of growth of the private US debt to GDP ratio was roughly 2.9% p.a. from 1945 till 2008. That means that the ratio doubled every 25 years, from 45% in 1945 to 90% in 1970, 180% in 1995, and if it had kept going, it would have been 360% in 2020. “Nothing unsustainable about” it, eh? This naivety by neoclassical economists about growth and exponential processes in general is positively dangerous for the human race. I’ll let Mish take over from here. Who has first access to credit? Answer: The banks, the political class, and the already wealthy. Who benefits the most from inflated asset prices? Answer: The banks, the political class, and the already wealthy. Who gets hammered in real terms by rising inflation? Answer: The bottom 10%, then the next 20%, then the lower middle class, then the upper middle class. Inquiring minds may be wondering "Is deflation really a problem?" The fact of the matter the natural state of affairs is deflation. Productivity improvements over time lead to lower prices. Attempts to prop up prices only benefits those in unions, those holding assets, and government bureaucrats who want to raise taxes. Deflation is only perceived to be a problem because of the reckless expansion of credit that preceded it. Look at it this way: If deflation caused a downward spiral in which everyone held off purchases expecting lower prices tomorrow, not a single computer would have been sold since 1990! Yet, the price of computers, memory cards, wide-screen TVs, and in fact everything technological has been dropping like a rock for ages. Every day such items are bought. That would not be happening if Fed and academic theories regarding the downward spiral of deflation were remotely true. Moreover, and as noted above, the unseen effect of the Fed's attempt to prop up wages and prices directly led to a loss of jobs to China. The "deflation is bad" theory is the biggest academic-sponsored fraud in history. Here is a crucial fifth question: What is the enabler of rapidly rising credit? The answer is fractional reserve lending. However, fractional reserve lending and expansion of base money supply by the Fed does not guarantee expansion of credit (a point Keen would agree with). Nonetheless, fractional reserve lending does serve as the enabler to massive credit expansion (a point Keen may dispute). Many Austrian economists make a huge mistake by assuming that money supply will quickly come pouring back into the system expanding 10-times or more, causing massive price inflation. The reality is banks lend if and only if both of the following are true. They have credit-worthy borrowers willing to borrow. For a discussion please see Can Bernanke Force Banks to Lend by Halting Interest on Excess Reserves? Before you object to point number 2, please read Reader Questions on "Credit-Worthiness": Did Banks Give Mortgages to Non-Creditworthy Borrowers? We are still not quite there. Let's not ignore the role of government in this mess. Numerous "affordable housing" programs helped send housing prices to the moon. President Kennedy authorized collective bargaining of public unions, driving up costs to cities, states, and taxpayers. Unions and politicians benefited. Everyone else lost purchasing power due to rising taxes. Student loan programs made debt slaves out of kids for life. In short, government interference into the free markets exacerbated the problem of Fed bubble-blowing policies. We can now finally answer the question. The result of all five practices is the hollowing out of the middle class from the bottom up. The solution is sound money, elimination of the Fed, the end of public unions, and minimal government interference in the free markets, not income rules, not misguided regulation of banks, and not more debates about how to measure something that cannot be measured.